Because I play both guitar and bass, I have an issue during live performance that I need to switch quickly between Bass and Guitar. Put the guitar down and pick the bass up and visa versa. – Pros- nice for playing. Cons- Slow and very cumbersome especially if you are wearing a top hat! Put your bass in the playing position on a microphone stand. Yes, we’ve actually done that! (I’ll put a post up about it.) – Pros- Very cool indeed. Cons- Takes up a whole load of stage space. Swing the guitar over my shoulder to the back and pick up the bass. Pros- Quite theatrical, reasonably comfortable to play. Cons- The leads get into a hell of a tangle and you have to be careful not to bash the guitar against anything. Thusly, the reason I have bought a wireless transmitter/receiver. is to cancel out the distinctly uncool tripping-over-wires scenario whilst flinging guitars about. (Incidentally, strap locks are essential). Whenever, I expend cash for stuff I tend to research online first, but in this case I couldn’t find anything on this kit because I guess it’s a very new product? 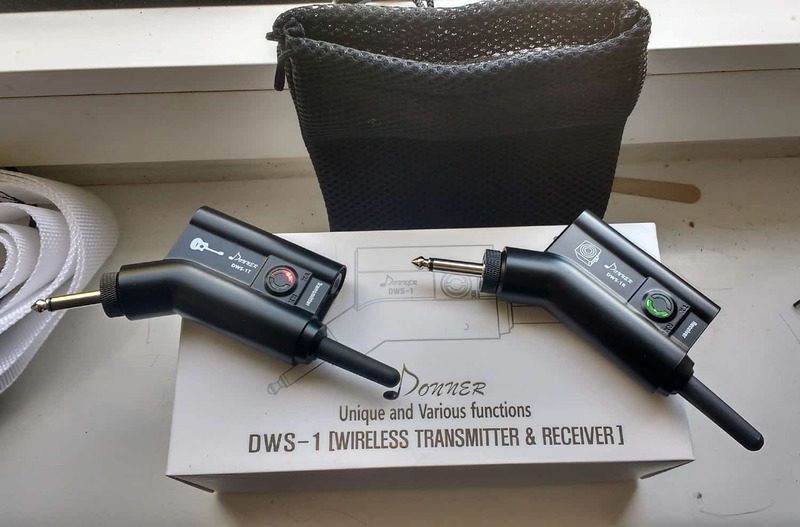 Rowin 2.4G Wireless Rechargeable Electric Guitar Transmitter Receiver. Cost £80.00 – looks ok and the swivel jack is nice, but worringly,I could’nt find a latency figure anywhere. Being a cheapskate, I took my chances on the Donner. What turned up was a pretty (rather unnecessarily large) white box containing a useful bag, along with the two units and a USB charging cable. The instruction leaflet features the amusing Chinese to English translations- for example: “If being related to cost service, even though passing or not passing the guarantee period, it needs the repair cost.” – You what now? Anyway – disappointingly the instruction leaflet is for a different product (DWS-2) so is of no use anyway. The build quality is ok, in hard matte black plastic with a metal knurled screw-in jack. the short antennae is firmly flexible. 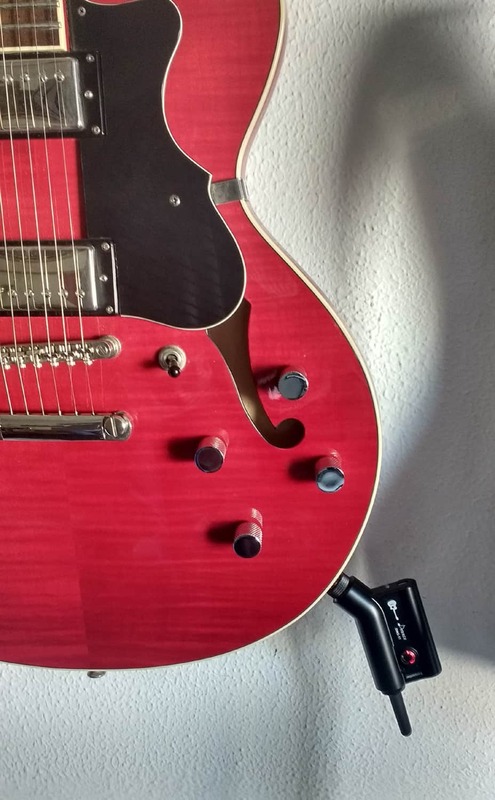 Design wise, they can’t be defined as pretty and because the don’t have the folding qualities of the other products I looked at, jut out from the guitar a fair bit, although they seem quite firmly in place. They’re not exactly discrete though. So in spite of not having any relevant instructions to ignore, I went ahead and plugged the units in – without charging or anything. And, I’m delighted to say it ‘just worked’. 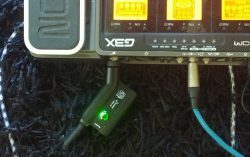 I plugged the receiver into my guitar effects pedal, pressed the ‘on’ button and the green lamp started flashing. 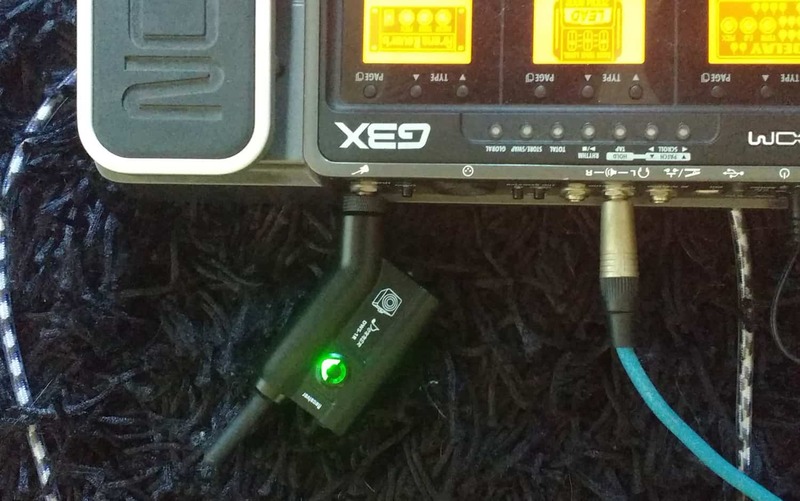 I then plugged the transmitter unit into the guitar, switched it on and within about 1 second, the green light on the receiver went steady and I started playing. Ideal! The latency is entirely un-noticable, I couldn’t tell the difference from a cable. The gain level is slightly lower than via a lead however. So adjustments of my usual setup are going to be needed. Immediately after first plugging in, these were used in a rehearsal and during this there was some break-up in the signal. 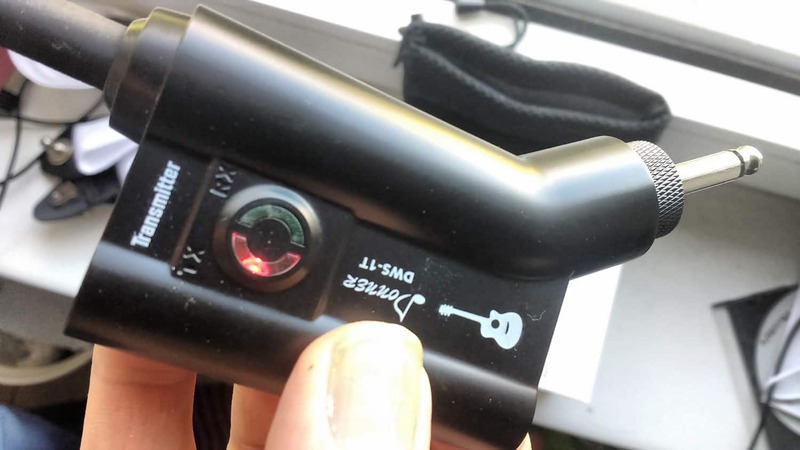 Very concerning because that is a total deal breaker… On investigation the knurled jack was very slightly loose on the guitar transmitter and tightening it up by hand resolved the problem. We played for 2 hours and considering I hadn’t actually charged them since arriving in the box, I was pleasantly surprised. I also walked away from the rig to check the distance and passed through a few doors making it an unfair test because these things do require reasonable line of sight. Anyway I got about 100 feet away before any decay in the signal which is plenty for me anyway. Most importantly of course is the quality of sound and none of us could detect any difference whatsoever between the cable and the wireless. They both sound great. So did I get away with being a stingy skinflint? Yes, on the whole I think I did. The downside of the design and the look of the thing is offset by the effectiveness and simplicity. The unit, if turned 45 degrees in the guitar becomes slightly less unsightly. Looking more stick-like, so it doesn’t have to look as bulky as the image implies. If money was no object I might have opted for the Xvive, for it’s neatness but I wonder if the latency being 3 times slower would be noticeable? Probably not, I’m sure. The blurb claims that 3 sets of these can be used simultaneously, the other products mentioned before boast 6 but I’ll only use one so this is not an issue for me. What I am dead chuffed with, is the freedom from the tether of a lead. It will put an end to my tying myself up in knots on-stage as well as the opportunity to terrorise the audience by stepping out amongst them. Should be fun! I’ll update this blog post with any further information if and when it become apparent. Luckily I play 2.5 milliseconds behind the beat, so we’re bang in time now Pete!